Paul Heyman of “FanRag Sports” has reported the Mets will opt to use Robert Gsellman in the 4th spot of the rotation. It’s no coincidence that this news comes after finding out that Steven Matz will skip his next start & obviously the Mets are hoping that that’ll be the worst of it. If it gets any worse & leads to a DL stint, the Mets will have to turn to Seth Lugo or even Zack Wheeler, who should be starting the season out bullpen. 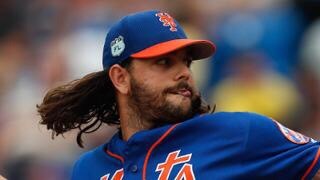 Gsellman has worked 17.1 innings this spring while striking out 9 batters while keeping his ERA at 1.56 & a 1.10 WHIP. In 44.2 career regular season innings, Gsellman owns a 2.42 ERA & a 1.28 WHIP while striking out 42 batters with a 4-2 record, all of this of course coming last year in the 2016 season. So for earning a spot in the Mets rotation & also having a pretty “rad” haircut, this week’s #MetsCrushMonday respectively belongs to Robert Gsellman. Congratulations on winning this weeks absolutely fictional award, ya earned it kiddo. Just…stay…healthy.